Recently I tried wagyu flank steak sous-vide for the first time, and liked the results with 24 hours at 56C/133F, but decided that I wanted to try 48 hours at 55C/131F as well since I was expecting that would be even better. Turns out my expectation was correct! This time I made it teriyaki style and it was outstanding. 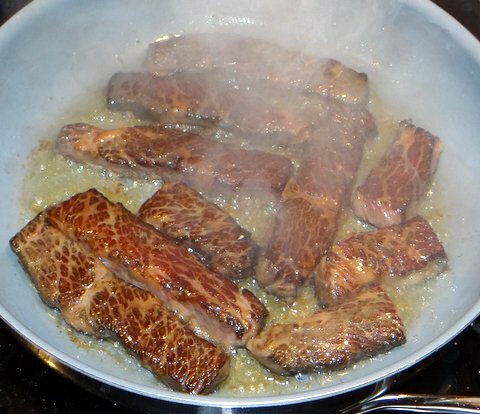 Please note that you could use the same method to prepare regular steak teriyaki, the only difference is that the steak would only need 4 hours or so at 55C/131F instead of 48. 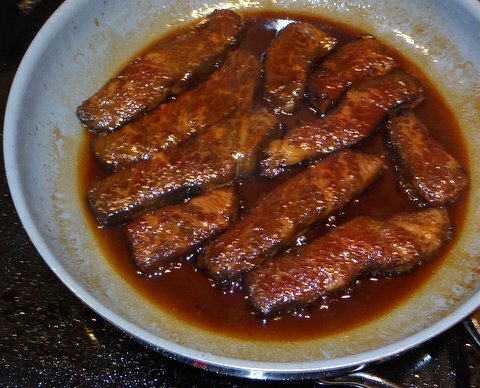 In this recipe, the teriyaki sauce is not made beforehand, but is created in the pan at the end of cooking to finish the steak. This method can also be used without sous-vide, but then you’d need to sear the steak a bit longer and need to rest it so the inside can come up to temperature. 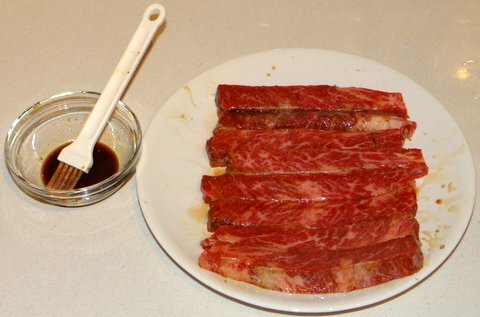 Lightly brush the wagyu beef with a bit of the soy sauce. 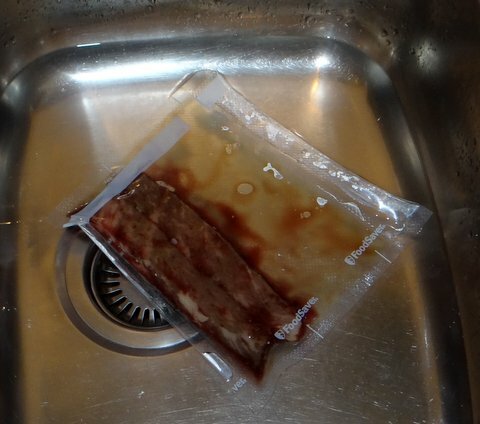 Vacuum seal in a pouch and cook sous-vide for 48 hours at 55C/131F. Force cool the steaks for a bit. For an even richer sauce, you can reserve the juices before cooling down to refrigerator temperatures. The cooling step is added to prevent overcooking the steak when searing and coating with teriyaki. 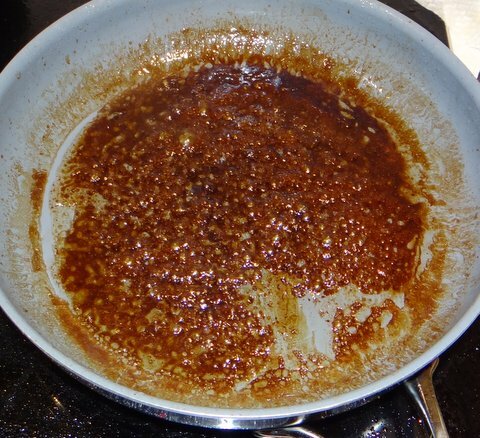 Heat some oil in a frying pan over very high heat and sear the steak quickly on both sides. Splash on the sake. Take out the beef and add the remaining soy sauce and mirin. 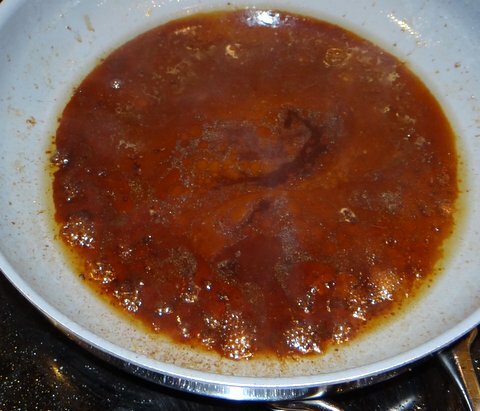 If you reserved the cooking juices, use this method to obtain the pure beef juices that won’t curdle, and add those juices as well. Stir and cook until the sauce is a bit thicker. Return the steaks to the pan and turn them around in the sauce to glaze them on all sides. Take out the meat, slice it up if eating with chop sticks, and arrange on warm plates. Thicken the sauce over high heat. Spoon a bit of the sauce on the meat and serve. This it outstanding with Amarone della Valpolicella, a powerful wine from the Veneto region in Italy. 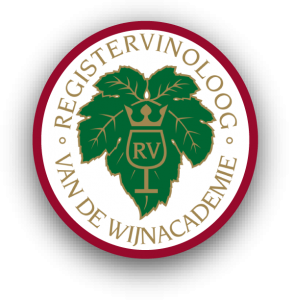 Amarone is a dry red wine made from dried grapes, sometimes with a touch of residual sugar. The tannins in the wine go well with the beef, the power goes well with the teriyaki sauce. We enjoyed it with a 2003 Amarone della Valpolicella from Allegrini, an amazing wine that I wish I had bought more bottles of when I visited the winery in 2007. Yum! Been seeing this sous-vide term out and about a lot lately. Must try it soon. I think your recipe would be a great place to start! Thanks for stopping by and leaving a comment. Sous-vide is great and I have many recipes on my blog. 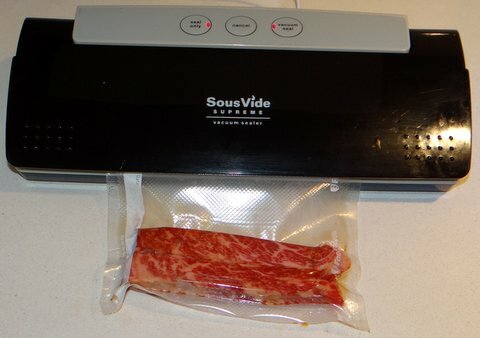 If you are actually going to give it a try, perhaps my sous vide page could be of use. Looks wonderful. Very nicely done, indeed. Just failed in a similar experiment. Probably I didn’t read we’ll enough and had in the sous-vide for 28 hours at 57C. When I wanted to take it out of the bag it almost fell apart; all the marbling was disappeared! So difficult to handle, fry and cut. It didn’t taste very good as well and had little bit a structure like liver or hare tenderloin. Maybe next time steak-like a short fry in a hot pan? Or sous-vide at a lower temperature? Hi Frans, for a rump steak 3-4 hours at 55C would have sufficed, as it is already tender. It is quite different from flank steak, which needs more time. 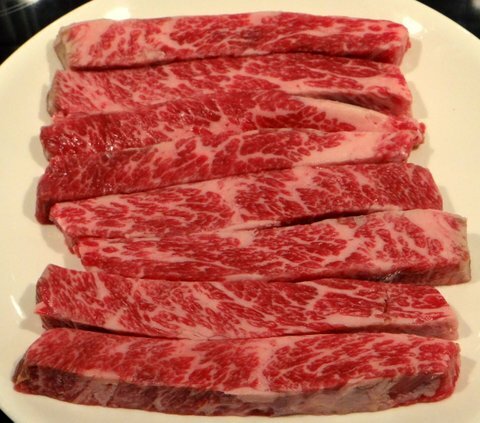 I cook most wagyu cuts at 55C, even those that for regular beef I would do at 57C (like short ribs).